The explosives I displayed against Willard were harnessed soon by Promoter Tex Rickard to produce five gates of more than $1,000,000 each. Those receipts were genuinely remarkable; for when Willard and I drew $452,224 at Toledo, that was the largest fight-gate on record. My five big-money bouts were with Georges Carpentier of France, Luis Angel Firpo of Argentina, Jack Sharkey of Boston, and Gene Tunney of New York (two). Because I was a good puncher and because each opponent in those five big-gate fights was a hard hitter, the tremendous publicity given those extravaganzas made the world more punch-conscious than ever before. Incidentally, don't let anyone tell you Gene Tunney couldn't punch. Many fight fans have that wrong impression today. In our first bout at Philadelphia, where Gene wrested the title from me, he landed a right-counter to the head that staggered me early in the first round. I didn't recover fully from that punch during the rest of the fight. And at Chicago, in our second scrap, Gene drove me to one knee with a head-blow in the eighth round. Mind you, that was after I'd floored him for the "long count" in the seventh. Indeed, I found Gentleman Gene surprisingly explosive. Since those golden Rickard-Dempsey days, the public's worship of punch has become more intense; for interest in the kayo sock has been stimulated increasingly by press, radio and television. And that intense public interest in punch has been one admirable aftermath of the blasting in Toledo. In addition, those big gates gave lads everywhere the desire to become good punchers so that they, too, might hammer out riches with their fists. Those two effects-public worship of punch and youngsters' desire to hit hard-would have had a most beneficial influence upon the science of self-defense, were it not for an unexpectedly blighting development. Unfortunately, my big gates did more to commercialise fighting than anything else in pugilistic history. They transformed boxing into a big-time business. As a commercial enterprise, the fight-game began attracting people who knew little or nothing about self-defense. Hoping to make quick money, they flocked into boxing from other fields. They came as promoters, managers, trainers and even instructors. Too often they- were able to crowd out old-timers because they had money to invest, because they were better businessmen, or merely because they were glib-talking hustlers. They joined the gold rush in droves-dentists, doctors, lawyers, restaurant proprietors, clothing manufacturers, butchers, grocers, bookies, racket guys, and pool-hall hangers-on. Fellows who never tossed a fist in their lives became trainers. They mistaught boys in gymnasiums. Those mistaught youths became would-be fighters for a while; and when they hung up their gloves, they too became instructors. It was only natural that the tide of palooka experts should sweep into the amateur ranks, where lack of knowledge among instructors today is as pathetic as among professional handlers. And that's not the worst. 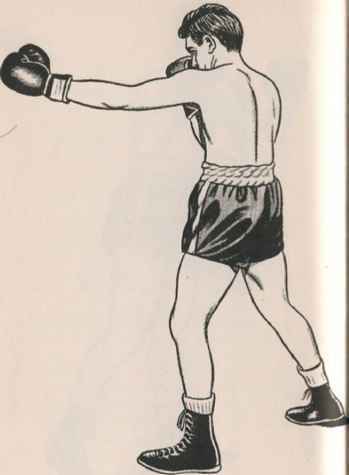 Too many amateur instructors have forgotten entirely that the purpose of boxing lessons is to teach a fellow to defend himself with his fists; not to point him toward amateur or professional competition with boxing gloves. To a menacing extent the major purpose of fistic instruction has been by-passed by amateur tutors who try to benefit themselves financially, indirectly or directly, by producing punchless performers who can win amateur or professional bouts on points. Not one youth in fifty has any ambitions to become a professional fighter when he first goes to an instructor. That's particularly true among college and high-school lads. Yet the instructors continue-teaching boys to become "smart" boxers instead of well-rounded fighters. And that's a downright shame, for punch is absolutely essential in fist-fighting and it's an invaluable asset in amateur or professional boxing. Actually, it's stupid instead of smart instruction to teach other fighting movements to a boy before he has been taught to punch. Because of this commercial, win-on-a-point-as-soon-as-possible attitude among modern instructors, the amateur and professional ranks today are cluttered with futile "club fighters" and "fancy Dans." In the professional game there are so few genuine fighters that promoters find it almost impossible to make enough attractive matches to fill their boxing dates. At this writing, lack of worthwhile talent in the heavyweight division is particularly appalling. It's almost unbelievable that the heavy division should have declined so far since the days when I was fighting my way up in 1917, 1918 and 1919. The class was jammed with good men then. Jess Willard was champion. On his trail were Carl Morris, Frank Moran, Bill Brennan, Billy Miske, Fred Fulton, Homer Smith, Gunboat Smith, Jim Flynn and Porky Flynn. And there were Sam Langford, Harry Wills, Tommy Gibbons and Willie Meehan. With the exception of fat Meehan, any one of those top-fighters could knock your brains out if you made a mistake while facing him. Meehan, although a slapper, threw so much leather and was so rugged that he and I broke even in our three four-round bouts. I won, we drew, and I lost. Lack of top-notchers in the heavy division and in most other divisions today reflects the scarcity of good instructors and trainers everywhere. There are a few good ones lingering on, but they are notable exceptions. Joe Louis found a good instructor when he was about sixteen. He found Atler Ellis at the Brewster Center in Detroit. Ellis, an old-time fighter, taught Joe how to punch and how to box. And when Joe turned professional, he went immediately under the wing of the late Jack Blackburn, grand old-time fighter and one of the finest trainers the ring ever produced. 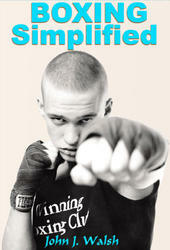 Joe developed into an accurate, explosive "sharpshooter" who could "take you out" with either fist. He was a great champion.